Joanna and I are busy stuffing our turkeys…. and once the family is stuffed with all the holidays bounty. We will make sure there is plenty of leftovers to hold them over, board a plane and head to Madrid, Spain to teach all about moda Precuts. You may have heard of Jelly Rolls ( 2 1/2″ strips), Layer Cakes (10″ x 10″ squares), Charm Packs ( 5″ x 5″), and the newest cuts Honey Buns (1 1/2″x 45″) and Turnovers (6″ Half Square triangles) Honey buns and Turnovers in stores beginning January. We will be teaching 2 days to 60 shop owners. The Confetti Cake pattern from the Pattern Basket is one of the classes I am teaching. 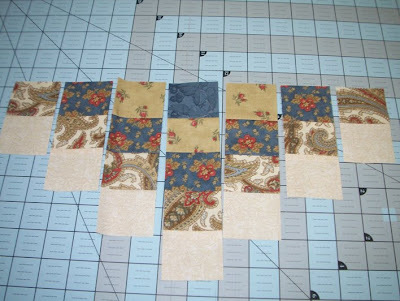 Margot does wonderful patterns including her line up of patterns using the moda precuts. Confetti Cake is one of my favorites. 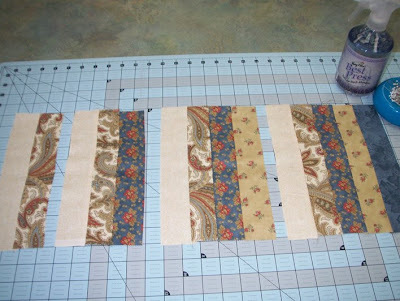 I have made this quilt 3 times now so I have taken some step by step pictures to show you how easy this pattern is. 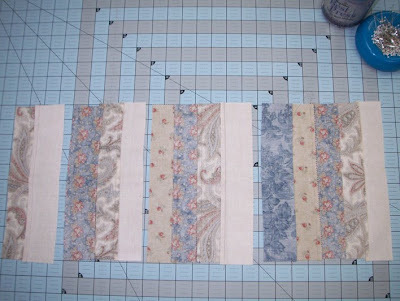 All you need is a moda layer cake, a center fabric, background and border. Line them up and resew them together. TA DA! Of course I forgot to take a picture of the finished quilt before I rushed it off to the quilter. I will post the pic as soon as maggi works her magic on it. Oh Ya, Joanna is fluent in several languages. I only talk English and Quilting, but I think we will all get along quite well. What a fun trip and a beautiful pattern. I like easy! I have not tried Best Press yet. have fun at your trip to Spain…! Oh no ;o) – another irresistible pattern…Definitely a ‘must have’. Have fun in Spain. I am sure you and Joanna will have a great time! I want to go to Spain with you and Joanna to teach! I could be your “teaching assistant”? I carry luggage? I could do my best “Vanna White” impression? I’m sure Kimberly would let me off work here at the Fat Quarter Shop to go with you! That looks like a great pattern. I just made the “sweet treats” free bag pattern from the Moda web-site, and I love it! This looks great! I was just over at ThimbleBlossom and she said to tell you that you are great and it looks like she was right! You ARE great! Awesome quilt -and it was so cool to go back and read the “behind the scenes” stuff – puts faces behind the products all we quilters clamor for! Definite bookmark to your new blog! Oh oh oh thank you for the pattern. I just got a layer cake from the fat quarter shop. It’s the first time I’ve seen one as for some reason they don’t bring them into New Zealand. But now I know what I can do with it. shame I have to work… I’d much rather sew!! Have a great trip… can’t wait till you get back – make sure you take lots of photos for us. Have a wonderful time in Spain. Make sure to get lots of sightseeing in and take pictures! Wow, looks really good. Welcome to blog land it is kinda hard to get away from once you start. There are so many amazing people and fun projects out there just waiting to be discovered. Looks like a great pattern! Can’t wait to get my hands on more of these cut goods! And OMG have a great time in Spain! Take lots of pics! Looks like a fun pattern to make, so many possibilities. If you have a chance to get to Barcelona, it’s one of my favorite cities to explore. Have fun! 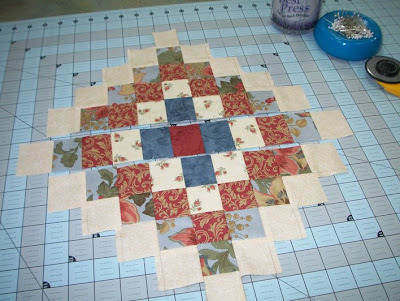 Gorgeous pattern and the finished quilt is so lovely to look at! I spent 18 months in Spain and I loved it!! I am very jelous of you and Joanna. Espero gue tines un bien tiempo! Oh so that’s how you get the pattern on the quilt. Niiice. Going to vote for you now. 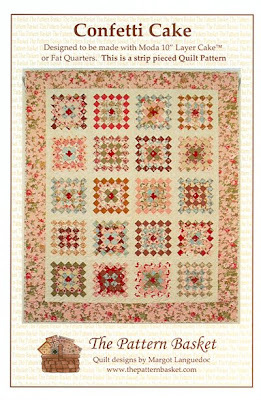 Love this confetti quilt, it has been on my list for a while now. Time to get moving on it! 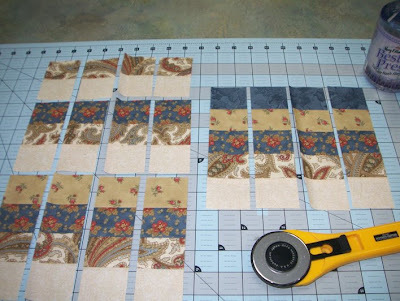 Love this quilt – and you have made three – bravo!!! Don’t know how you two are going to manage this fantastic trip without luggage assistance. I’m available! I’ve been eyeing this pattern. Now that I know it’s easy I’m going to have to try it. Thanks for showing the steps! You left a comment on my blog. I wanted to come to yours and find about you. This is a good use for a layer cake! Looks like it would be easy to do.